The roots of Ashkenazic cuisine lie in medieval Germany. In medieval Europe, Jews had congregated in separate parts of towns for protection and so as to be able to practice their religion, and Jewish quarters grew up around synagogues. In Germany, the Judengasse (Jewish quarters) had their own cemeteries, schools, laundries, public baths, law courts, slaughterhouses, and bakehouses. Housewives brought their food to be cooked in the communal oven and did their cooking at the bakehouse. Few had cooking facilities at home. One part of the bakehouse was reserved for meat, another for dairy. The oven and cooking utensils, including huge copper cauldrons used for wedding feasts, were provided free by the congregation. A shohet, or slaughterer, was available. There were banqueting rooms and dancing halls for weddings and festivals, and for getting together on the Sabbath, and there were guest houses for travelers. A community fund provided those who could not pay with three days’ free board and lodging. The religious dietary laws were abided by with strict tenacity, and this had the effect of involving Jews in food trades. Because wine manufactured by a gentile could not be consumed and food cooked by an unsupervised gentile could not be eaten, Jews were encouraged to produce and sell wine and food themselves. At one time they controlled the market in wine and grain, dealing in oil as a side line. In Southern Europe they owned flour mills and vineyards. Jewish orchards were renowned in France. In France and in Germany, where Jews had had vineyards along the Rhine as early as the fourth century, they produced wine. In Germany they reared geese. Throughout Europe, Jews were much in evidence at city markets and country fairs, selling pickles, preserves, and pastries. Jewish bakeries were common. There was a strong ascetic streak in German Jews, and their lives were inclined to spirituality rather than sensual expression. Ethical writings from medieval times are full of encouragement towards frugality and self‑restraint in eating—“the most animal of instincts.” Rabbis expressed distaste at the way their French, Italian, and Spanish coreligionists enjoyed their meals and their glass of wine. In Eat and Be Satisfied, John Cooper quotes a 13th‑century letter reprimanding the French Jews for “studying the Talmud with their stomachs full of meat, vegetables, and wine” and another warning that “gross overeating is as dangerous to the body as a sword, besides that it bars one from occupation with the law of God and the reverence due to him.” But despite all the protestations they were hearty eaters like the Germans. They ate like the Germans—substantial foods, warming soups thick with oats, barley, groats, and dumplings; heavy rye and dark breads; pickled and boiled meats and sausages; freshwater fish and salt herring, cabbage and carrots. They had a penchant for strong flavors, such as horseradish, sour pickles, and sauerkraut, and for sweet‑and‑sour and savory‑sweet combinations like cabbage and apple. And like the Germans, they stuffed goose necks, chopped goose liver, and chopped and stuffed fish. But there were also foreign elements in their cooking, adopted through their contacts with their European coreligionists. Noodles came from Italy. Pasta had been introduced there by the Arabs in Sicily when the island had a substantial Jewish community The Jews called it “grimseli” and “vermisellish,” after the Italian vermicelli. Their mercantile activities brought the Jews of Europe into contact with exotic ingredients and Oriental culinary styles. Since the early Middle Ages, they had been involved in international trade, trafficking by raft and craft down the valleys of the Rhone, the Danube, and the Rhine, and going far afield. For their own ritual requirements, they imported myrtle from France and citrons from the coasts of the Mediterranean. They dealt in sugar, spices, dried fruit, and nuts, and all kinds of foodstuffs from the East. Their role in introducing such comestibles to Northern Europe produced an enlightened spirit in their own cooking. They became known for their immoderate use of garlic and onion, and for their taste for spices, fruits, and nuts (they were famous for using almond marzipan in their pastries). By the time Jews became segregated in their ghettos, by edict, in the 16th century, they had developed a unique and powerful internal social culture. As the French historian Fernand Braudel commented, the ghetto became their prison but was also the citadel into which they withdrew to defend their faith and the continuity of their culture. It was at that time that ritual took an increasing hold on Jewish life. A code of kitchen and table manners was formalized, and particular dishes were adopted to celebrate the Sabbath and festivals. The men, who often devoted themselves entirely to studying Jewish Law and left their wives and daughters to earn the family living, took a particular interest inthe kitchen. They became involved with the minutiae of the dietary laws and rituals concerning food. On Thursdays and Fridays they would be seen bargainingfor Sabbath delicacies at the market, and on Fridays they helped with cleansing the dishes and saucepans and setting the table. It is in the cooped‑up world within the ghetto walls, in the tall houses that met at the top and obscured the sunlight from the narrow streets, that a set of dishes became associated with holidays and were marked forever with a Jewish stamp. Everyday food could be desperately poor, but the best German burgher dishes were reserved for Sabbath and religious festivals. 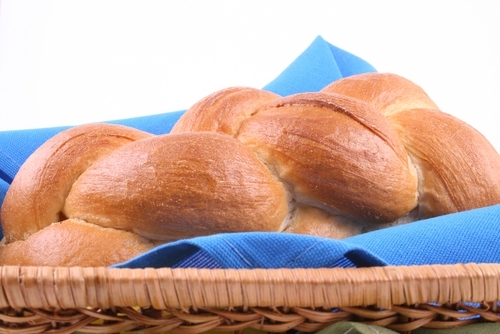 Braided white challah bread, sweet‑and‑sour fish, stuffed fish, chopped goose liver, broth with noodles, meat pies, boiled pickled beef, roast goose, and kugel—a sweet pudding made with noodles or bread—were eaten on Friday evening. Cholent was left to cook overnight in the communal oven for Saturday. This dish—one of the most representative of Jewish cooking—in a version cooked today combines different meats, sometimes including goose and sausage, with barley or buckwheat and beans, and is cooked slowly in plenty of goose fat. It is believed to be related to the French cassoulet, and its name to be a combination of the medieval French words chauld (hot) and lent (slow).This interpretation is given weight by the fact that Jews in the region of the Languedoc, where cassoulet originated, were expelled in 1394 and headed for Germany. In Eat and Be Satisfied, John Cooper notes that the first reference to cholent was by Rabbi Isaac of Vienna (c. 1180‑c. 1250), who reported that he had seen it in his teacher’s home in France at the end of the 12th century. White haricot beans, which came to Europe from the New World, were a late addition to the dish. They may have arrived through connections with the secret Jews from Portugal, who were very familiar with the beans and who settled in cities in southwestern France in the 16th century. In Spain, today, large white beans are called judias, meaning “Jewish.” I wonder if there is a link. Pronounced: CHO-lent, Origin: Yiddish, but believed to be derived from French, a slow-cooked stew traditionally prepared for and left cooking over Shabbat.